42°19′42″N 77°39′49″W﻿ / ﻿42.328333°N 77.663611°W﻿ / 42.328333; -77.663611﻿ (Adsit House) Hornell The house was demolished on June 15, 2010. 42°20′13″N 77°19′34″W﻿ / ﻿42.336893°N 77.3260887°W﻿ / 42.336893; -77.3260887﻿ (James H. Bolton House) Bath Well-preserved 1909 Queen Anne Style house has many of its original interior finishings. 42°09′25″N 77°47′45″W﻿ / ﻿42.1569017°N 77.7959382°W﻿ / 42.1569017; -77.7959382﻿ (Temple Beth-El) Hornell 1946 synagogue, currently vacant, reflects Jewish settlement in small cities across upstate. 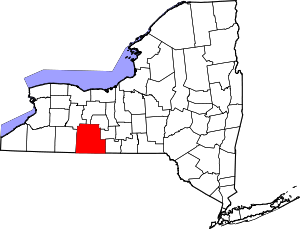 Wikimedia Commons has media related to National Register of Historic Places in Steuben County, New York. This page was last edited on 16 December 2018, at 16:03 (UTC).